Vancouver police Chief Adam Palmer held a press conference on Friday to announce the city's opioid crisis had become even more alarming: Nine people died of drug overdoses the night before. 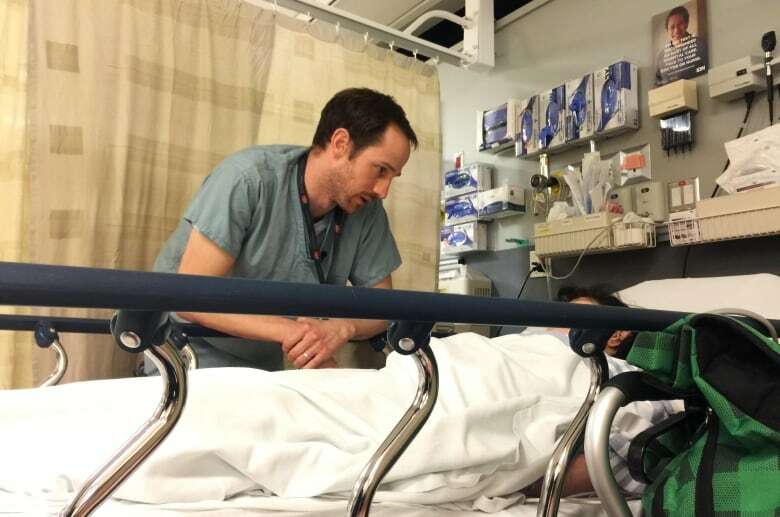 CBC News recently spent a shift in the emergency department at St. Paul's Hospital to observe the crisis first-hand. "Somebody's overdosing in the bathroom!" 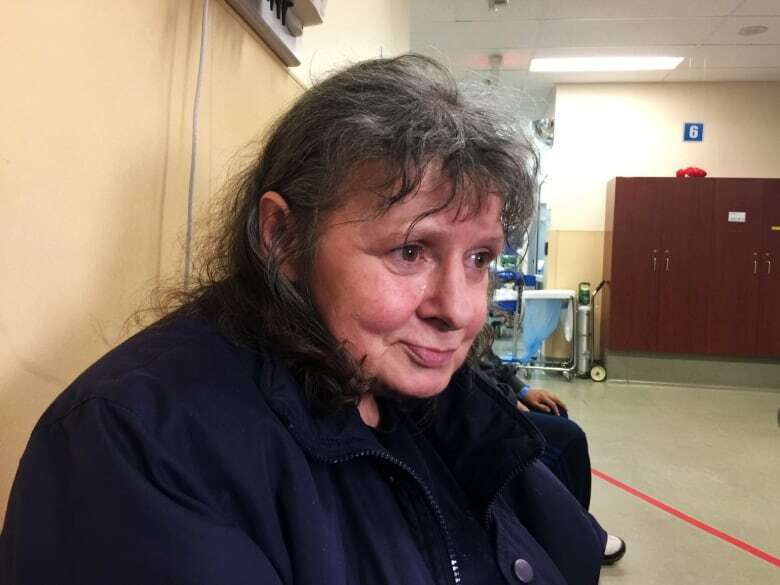 Geri Platko, 62, yells from a public washroom in St. Paul's Hospital. Security comes running to alert Tanya Campbell, the nurse in charge of triage on what will be a busy night. "Is it actually an overdose?" Campbell asks as she quickly pushes an empty gurney down the hall. She gets her answer as soon as she turns the corner and sees Platko's friend slumped on the floor. "Did you give her Narcan?" Campbell asks, referring to the brand name of the opioid antidote naloxone. 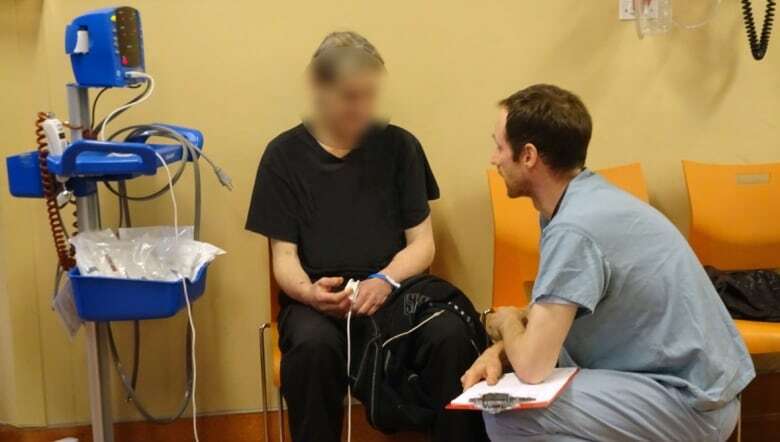 Platko tells the nurse she gave her friend two doses from her take-home kit. The middle-aged woman still isn't moving. "Wakey wakey … come on in, sweetie," Campbell says as she lifts her limp patient onto the stretcher. "Lay on your side, we're going to take you to emerg." "You overdosed!" Platko yells, annoyed with her friend for doing too much of the heroin, which may have been laced with fentanyl. "She said, 'When you fix, don't do it all, do half.' I said, 'You, too,' but she threw it all in. Platko says it was the first time she used her Narcan kit. "I felt good because I put it right in the muscle," she says proudly. Campbell says Platko saved her friend's life. Her friend overdosed right after being discharged from a unit upstairs — she needed a fix while she and Platko waited for a taxi. 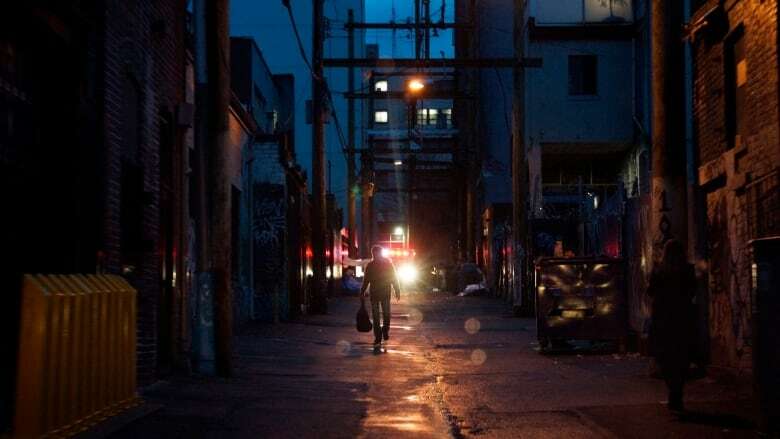 Vancouver-area hospitals have treated more than 6,000 drug overdoses so far this year, but St. Paul's Hospital downtown gets more than 70 per cent of cases, making it ground zero of Canada's fentanyl crisis. Between Jan. 1 and Dec. 14, the emergency department treated 4,548 overdose cases. That's an average of 13 a day, many of which are believed to be caused by fentanyl. Police Chief Adam Palmer held a press conference Friday to announce the city's crisis had become even more alarming: Nine people died of drug overdoses the night before. CBC News spent a shift in St. Paul's emergency department to observe the crisis first-hand on a particularly busy night — Nov. 24, the day after the last provincial welfare cheques were issued. As Platko waits for her friend to regain consciousness, she recalls her own overdose three days earlier at the same hospital. "They told me if I wasn't in the hospital and did it, I would be dead. My heart stopped and everything." Platko, who says she's been an addict since she was 14, remembers getting a shot of Narcan in her thigh and the medical team trying to revive her. "I could see them and hear them, but I was dead," she says. "My heart stopped. I could see the monitor go choo, choo, choo, choooooo," as it flat-lined. "I was trying to tell them ... 'Be careful, this hurts, guys,' but I couldn't talk. I couldn't move or anything. They were like 'boom' on my chest." She recovered and so will her friend, says Dr. Kevin Nemethy, who leans down to try to talk to Platko's friend, who can barely keep her eyes open. "Do you remember what happened? … Are you on the methadone program or the suboxone program?" He suggests she visit the hospital's new rapid-access addiction clinic; no appointment necessary. Nemethy says getting his patients to the clinic is easy, but getting them an addiction treatment bed is difficult. "There is often a significant delay, so we feel that puts the patient at risk of a relapse. So they continue to use." Alexandra LaViolette, 24, says she was also encouraged to visit the rapid-access clinic after she overdosed. "I remember being told that I was dead for 10 minutes," says the tall, thin redhead. "I wasn't breathing for about seven to 10 minutes. "I honestly don't remember even doing the drugs." She says it was her first overdose. Paramedics picked her up at her friend's apartment, but her friend was long gone by that time. "She was found outside on the road … she didn't wake up until she got in the ambulance, so we're going to keep an eye on her," Campbell says. "As you see her now she is awake, she's alert, but that doesn't mean she won't go back down." LaViolette's eyes roll back and close mid-sentence. She struggles to stay awake as the Narcan wears off. "I think it was probably heroin and it had been laced with fentanyl," she says. "All of a sudden you have this crazy batch of super strong stuff … Nobody in their right mind should be serving a cocktail that strong." She wonders what might have happened had she been alone, with no friend to call 911. Nurses give her and every other overdose patient an egg sandwich and a glass of apple juice while they sit on a hard resin chair near the front entrance. That way the triage nurse can see them in case they pass out. Campbell says she sees many of the same patients over and over. They overdose, get "Narcanned" and then overdose again. "Yesterday we had someone come back seven times in one day … it can get overwhelming. It can get to the point, 'Why are we doing this?'" But Campbell is an optimist. "I haven't seen him today so perhaps he is getting a little bit better. You just hope." A bit later, a patient starts screaming about chest pain. He tells CBC News that paramedics were too rough while performing CPR on him the day before. Dr. Nemethy and two paramedics try to coax him back to the ER, fearing cardiac arrest. 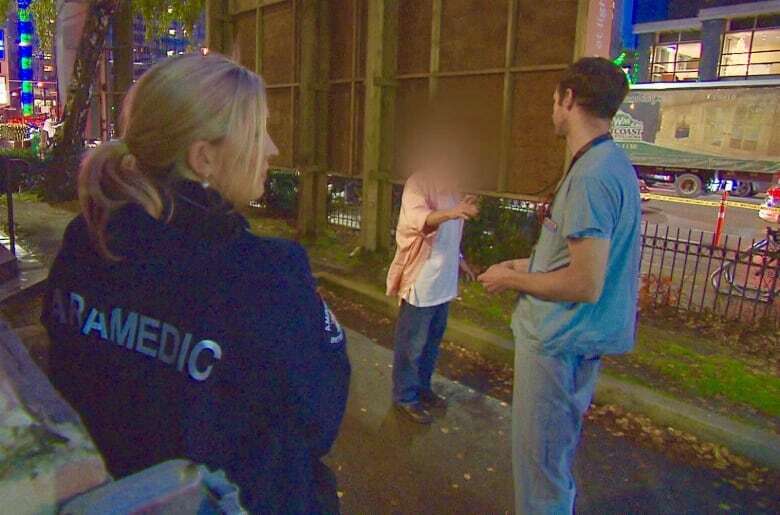 'Come inside, let us help you,' Nemethy tells a patient who overdosed the day before and returned to the ER complaining of pain from the chest compressions that saved his life. Outside in the ambulance bay, he appears to be so high, he falls down. "I do not have to go into that hospital, I want to go!" he screams. "You just fell over. We're just trying to make sure you're OK," Nemethy says. The man leaves, against medical advice, as do 17 per cent of all overdose patients. Doctors and nurses know the urge to use again returns quickly when Narcan wears off. But this was a good shift because every overdose patient survived. The latest B.C. Coroners Service statistics show 755 overdose deaths in the province so far this year. Nemethy didn't have to deliver devastating news to anyone's family — a task that never gets easier. "There's nothing harder in our job" Nemethy says of having to tell parents their teen couldn't be revived. As his shift ends, a firefighter is heard on the emergency radio reporting another overdose patient is on the way. "Tell ambulance this is not a pedestrian struck; this is an overdose in the middle of the road, over." "Copy that," the dispatcher says.